Joe Cada capped off an incredible summer by winning his second bracelet of the year and the fourth of his lifetime in Event #75: $1,500 The Closer No-Limit Hold'em just days after finishing fifth in the Main Event. The 2009 Main Event champion bested a field of 3,120 entries to claim the $612,886 top prize. "I feel amazing. What a way to cap it off!" Cada said. "I've been running good and deep in every tournament, and the tournaments I busted, I feel good about how I played. I haven't played many tournaments this summer, and I'm kind of upset that I didn't play more, but it feels good to close it out." When asked about whether or not he would attend the World Series of Poker Europe this fall, Cada said it was unlikely since he's still not close to approaching Shaun Deeb in the Player of the Year race. "It just goes to show how good some summers end up and how good some of these players are." 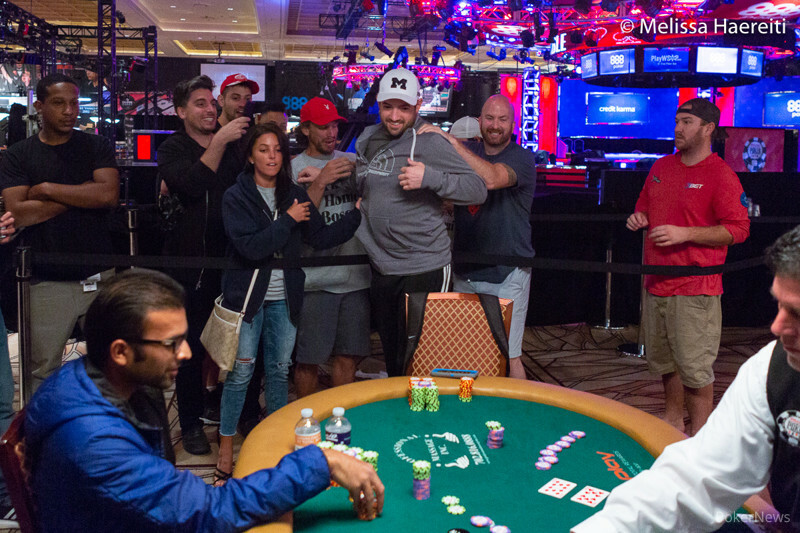 Deeb also took his seat for the final day of this event but busted within minutes after cards were in the air. This event played out over the course of four days; there were three starting flights and all 331 surviving players combined for Day 2 action. Cada began the day with a viable stack of 31 big blinds and chipped up rather steadily. Although the action was fast and furious throughout the day, Cada was rarely all-in and at risk once the final table was reached. While this event drew players from all across the poker spectrum, Cada wasn't the only familiar face to make it deep. Two-time bracelet winner Benjamin Zamani departed in 22nd place when he got his stack in on the flop with top pair of jacks only to see his opponent pair his king on the river. Leif Force was the next to go in 21st; he lost a crucial coin flip holding pocket eights that left him with less than 2 big blinds and his ace-eight couldn't overcome Joshua Turner's ace-nine the following hand. Chris Conrad was dispatched in 18th place by the eventual champion in a massive three-way all-in where Cada doubled up in addition to stacking Conrad. Tristan Wade fell in 17th when his eight-seven suited failed to sufficiently improve against Turner's pocket eights (the case card showed up on the flop). German crusher Martin Finger made his exit in 13th place when he couldn't beat Richard Cox's trip kings. Shortly thereafter, the unofficial final table was reached. Cada carried about 4 million chips into ten-handed play but doubled through Brayden Gazlay almost immediately. 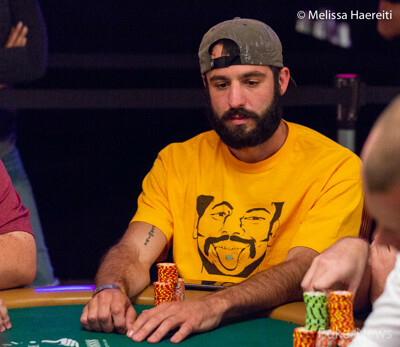 After Sam Simmonds busted in tenth when his aces got cracked on the river by Eric Afriat, who held pocket kings, the remaining nine players took a dinner break and reconvened at about 11:00 p.m. PDST. It took just 12 hands for the first player at the official final to fall. Joshua Turner got his chips in with king-queen against Cox's king-ten suited only to see Cox spike a ten. Gazlay departed the very next hand in eighth place when he lost a coin flip holding queen-jack of diamonds against Eric Afriat's pocket sevens. Shortly thereafter, Jimmy Poper hit the rail when his six-five suited couldn't get there against Paawan Bansal's ace-four suited. The action slowed for about 20 minutes thereafter until Cox got his stack in with pocket jacks against Richard Ali's pocket tens and saw a ten show up on the flop (the turn and river brought no help). Bansal built a fairly large stack over the course of the level, and shortly after Afriat busted in fifth when his kings were cracked by ace-eight, Cada doubled up through Bansal to seize the chip lead. In a battle of the blinds, Bansal shoved holding jack-seven, Cada called to put himself at risk with ace-eight, and his hand held up. The final few bustouts came at a frantic pace. Ali departed in fourth when he got his stack in with pocket fours against Cada's pocket eights and the board provided no help for either player. The very next hand, Tanouye was eliminated in third holding ten-eight against Bansal's pocket queens and got no help from the deck. Although the action at the Rio All-Suite Hotel and Casino is drawing to a close, The Big One For One Drop is still ongoing with two days left to play, so be sure to keep it here for all the updates from the PokerNews Live Reporting team. Paawan Bansal Eliminated in 2nd Place ($378,765), Joe Cada Wins for $612,886! On the first hand in heads-up play, Paawan Bansal raised to 2,200,000, Joe Cada three-bet to 7,000,000 and Bansal four-bet ripped. Cada had no trouble making the call. The flop came and Bansal spiked five outs to get ahead. Cada's rail asked for a deuce to reduce some of Bansal's outs but the dealer had even better card up his sleeve. He turned up the turn, leaving Bansal drawing dead and Cada's triumph got a cherry on top in the river for quads. 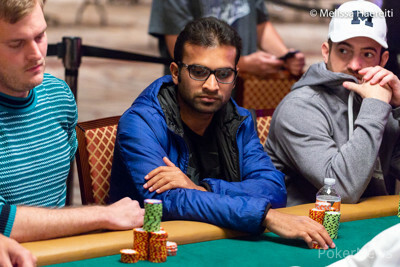 Bansal was rewarded $378,765 for his runner-up finish. After making the final table in the Main Event, Joe Cada provided another fabulous story, winning his fourth career bracelet and the $612,886 top-prize. 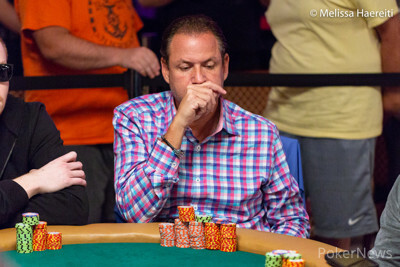 Jeffrey Tanouye raised all in from the small blind and Paawan Bansal looked him up in the big. Bansal turned up a monster with while Tanouye had only . Bansal hit heavy on and the turn officially eliminated Tanouye. The meaningless completed the board and Bansal almost tied Cada in chips ahead of the heads-up match. Hand #69: Richard Ali moved all in from the first position and Joe Cada repushed in the small blind. Cada had a superior pair and prevailed on the board of , eliminating Ali in fourth place. Hand #64: Action folded around to the blinds, Paawan Bansal shoved from the small, and after a bit of time in the tank, Cada called to put himself at risk. Cada had the preflop edge and Bansal needed to improve in order to win the pot. The board ran out and Cada doubled up. 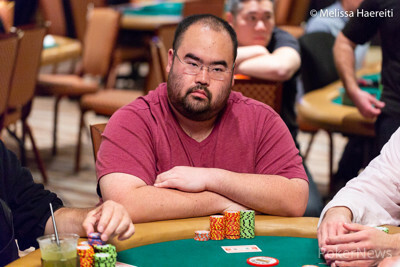 Hand #65: Cada called from the small blind and Jeffrey Tanouye checked his option. The flop came , Cada bet 600,000, and Tanouye called. They both checked the turn and river. Cada showed and his hand was good enough to win the pot. Hand #66: Richard Ali got a walk in the big blind. Hand #67: Paawan Bansal got a walk in the big blind. Hand #68: Ali shoved from the button and won the pot uncontested. Hand #63: Eric Afriat shoved from the cutoff and Jeffrey Tanouye called from the button to put Afriat at risk. Afriat had a commanding lead and Tanouye needed to improve in order to stack him. The board ran out and Tanouye took the pot to end Afriat's deep run in this event. Hand #56: Eric Afriat pushed in the small blind and Jeffrey Tanouye peeled so he called for his last 3,125,000. Afriat held and the runout didn't help him. Hand #57: Joe Cada shoved in the cutoff and took the pot. Hand #58: Paawan Bansal got a walk. Hand #59: Tanouye jammed in the cutoff and it came through. Hand #60: Bansal raised the button to 1.4 million and scooped the pot preflop. Hand #61: Afriat shoved 2,425 from the small blind but Tanouye couldn't press the call button. Hand #62: Under the gun, Bansal made it 1.7 million and nobody was interested. Hand #53: Richard Ali shoved from the small blind and won the pot without a fight. Hand #54: Eric Afriat shoved from under the gun and Jeffrey Tanouye called from the cutoff with a covering stack. Tanouye had the best of it preflop and Afriat needed to improve to survive. The board ran out and Afriat doubled up with a flush. Hand #46: Paawan Bansal made it 1.3 million in the cutoff and Jeffrey Tanouye called in the big blind. They checked the board and Bansal's beat the in the showdown. 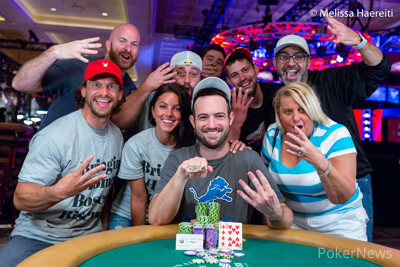 Hand #47: Eric Afriat made it 1.5 million on the button and won the pot. Hand #48: Afriat limped in the cutoff, Ali completed, and Bansal checked to see the . Afriat bet 1.3 million in position and Bansal check-shoved. Afriat let it go. Hand #49: Joe Cada received a walk. Hand #50: Tanouye shoved under the gun and found no customers. Hand #51: Bansal open-shoved in the cutoff and won the pot. Hand #52: Ali received a walk.